Hide.me is yet another Virtual Private Network (VPN) fish in a very busy river. In fact, you may not have even heard of this service due to the size of this crowded and highly competitive industry. Whether you’re familiar with this service or not, today I’m going to pick it apart piece by piece to see whether it keeps up with industry leaders or lags behind the competition. This Malaysia-based VPN provider certainly has some advantages over other services, but is it the best service that will suit your specific needs? I’ll help to answer that question, but first let’s run over this VPN’s basic pros and cons before moving onto its pricing model. From the beginning, I was very impressed with Hide.me’s pricing model. First of all, there is a free version of its VPN service. That’s actually pretty atypical. Instead of offering a free service, most other competitors only have a short trial version, which quickly expires, or provide a money-back guarantee. And here’s the best part: you can get Hide.me VPNs free plan without a credit card or payment card information to sign up. That’s extremely uncommon in the world of digital services, too. Usually a digital service will try to hook free users by forcing them to enter payment card data before the free service can be downloaded. Then, after a certain amount of time, the free service expires and the customer is automatically billed. It’s a shady and questionable “gotcha” marketing technique, but thankfully, Hide.me doesn’t engage in such dubious practices. As you can see, Hide.me discounts longer term subscription heavily. For that reason, I don’t see a lot of value in the monthly subscription plans, even as a means to test out the service – especially considering that there’s a free version that works great for short-term use. To be completely honest, I was a little appalled at the monthly pricing of the Premium plan. Nevertheless, when considering the annual subscription plans, $4.99 is very reasonable, and cheaper than most other competitors. The Premium plan is a little on the high side, though it does come with some extra goodies. For perspective, consider that the 12-month subscription plan for ExpressVPN costs $8.32 per month, which isn’t too far away from $9.99. As the saying goes, if it sounds too good to be true, it probably is. Even though Hide.me offers a free service with generous terms, there are a lot of limitations that paid subscriptions lack. First off, note that free users only have access to three server locations, in Canada, the Netherlands, and Singapore. To be more blunt, free users don’t have access to some of the most popular VPN connection locations, such as the US, the UK, Hong Kong, and other popular destinations. Even though Hide.me doesn’t perform bandwidth throttling to limit free users’ connection speeds, the bandwidth is only best effort in nature. That means that free users’ traffic will take lower priority than paid subscribers’ traffic, which leads to unreliable speeds during peak server utilization. Having said that, note that Hide.me does guarantee at least 3Mbps for free users. There’s a data cap as well, though it’s pretty generous. Hide.me limits free users to 2GB of data transfer per month. For the sake of comparison, know that TunnelBear limits its free users to 500MB of data per month. Hide.me allows four times as much data for its free users. Hide.me restricts free users’ connection protocols as well. You’ll have access to Point-to-Point Tunneling Protocol (PPTP), (Secure Socket Tunneling Protocol) SSTP, and (Layer 2 Tunneling Protocol) L2TP. With the exception of PPTP, the other protocols will offer adequate security. However, OpenVPN is my favorite connection protocol, and SoftEther connections are reserved for paid subscribers too. Last but not least, note that free users can only have one active connection at a time. Again, this is typical of free services and trial versions. It’s possible to use the free service on as many devices as you wish, but only one device may have an active tunnel connection at a time. What Do I Get with Hide.me Plus Plan? The Plus plan costs as little as $4.99 per month. Since it’s a paid subscription, there aren’t nearly as many restrictions. Instead of being limited to only three locations, Plus users gain full access to all 30+ locations. And instead of bandwidth being best effort, Plus users get priority over free users. If your internet connection is fast enough, Hide.me claims you can enjoy connections in excess of 150Mbps. In addition, Plus users get full protocol access and gain the use of OpenVPN and SoftEther. While that’s all well and good, there were two things about the Plus plan that I really didn’t like. First of all, Plus users are still only allowed one simultaneous connection per account. I found that to be a little irritating, since it’s more typical for services to allow two to six simultaneous connections. Furthermore, there is still a monthly data cap. Plus users are limited to 75GB of data per month. Personally, I don’t engage in a lot of heavy downloading on a regular basis, so 75GB of data would usually be enough for an entire month. But I still feel that this restriction needs to be eliminated. Plus users are paying for the service, after all. And I can think of a couple of cases where the 75GB data limit would be extremely encumbering. Let’s take a moment to consider people who download torrents heavily. Average users may not see a large problem with a 75GB data limit, but torrent downloads can quickly add up. Even with compression techniques, someone who regularly uses BitTorrent could quickly eat through their month’s allotment of data. Additionally, let’s consider anyone who uses cloud backup or cloud storage solutions. 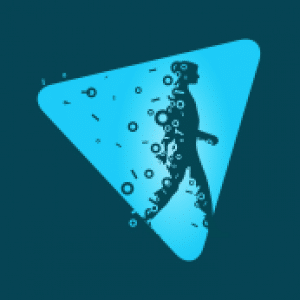 If you needed to completely restore a system or a large batch of files after a hardware failure or virus through a secure tunnel, your monthly data would vanish in the blink of an eye. While it’s true that most cloud storage and backup providers offer client-side encryption, you can never be too safe in the wake of Google and Dropbox security issues and the watchful eye of the NSA. For these practical reasons, I was very disappointed to see a data restriction on Plus users. What Do I Get with Hide.me Premium Plan? 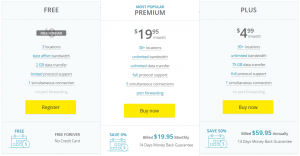 Last but not least is the Premium plan, which costs $9.99 per month at its lowest price point. Like the Plus plan, Premium users enjoy access to servers in 30+ countries, full protocol support, and unlimited bandwidth. However, Premium users don’t have a monthly data limit. Instead, they get unlimited data. Premium users also have the ability to connect up to five devices simultaneously, which is great if you’ve got a family or just have a lot of mobile devices and computers to secure. In situations where several people are using the same account, I can begin to justify the higher price. And lastly, there are proxy and port forwarding features as well. I tested out two different VPN servers and ran a speed test, both while using the VPN tunnel and without the tunnel connected. This helps give a side-by-side, objective comparison of performance. Note that in the Hong Kong speed tests my latency was much faster through the VPN tunnel, and my upload rate improved a little. My download rate was nearly cut in half though. As for the US speed tests, I lost nearly half of my download rate and upload rate. There was a little extra latency in the US tests too, but nothing to get worked up about. I wouldn’t say that Hide.me has slow speeds, but it definitely isn’t one of the fastest services. With my connection, I was able to browse websites and download data via Hypertext Transfer Protocol (HTTP)/ Hypertext Transfer Protocol Secure (HTTPS) without any noticeable difference. There weren’t any hindrances or buffer issues with streaming video, either. To sum it up, I thought Hide.me VPN’s speeds were decent, but I do wish the connection was faster. I was quite impressed with the support department for several reasons. First of all, you can initiate a ticket with the 24/7 support department the old fashioned way via a web form on the website. Alternatively, you can use the community page, which serves as a forum, to help you find answers to your questions without needing to open a ticket. Oh, and guess what? It has a live chat feature! I love live chat because it provides nearly instantaneous access to technicians. I pinged a support agent named Eric (I never know if the techs are using a pseudonym or if his name was genuinely Eric) and got a response within 15 seconds. “Eric” seemed to be a pretty knowledgeable fellow, and he was able to accurately answer my questions regarding technical aspects of different connection technologies. Way to go Eric, I’m awarding you an A+ for a fast response time and competent answers. Should I Use Hide.me VPN? Now it’s time to answer a tricky question. Would I personally recommend this service? Well, that’s a very nuanced question. On the whole, I was pleased with Hide.me VPN, due to decent features, a generous free service, and great tech support. But there were a few things that I didn’t like. For starters, I didn’t like the Plus plan. I find it repugnant that the Plus plan is limited to 75GB of data per month. I also didn’t like the fact that the Plus plan is limited to one simultaneous connection. For those reasons, I would stay away from the Plus plan unless you only want to secure one device, and don’t have demanding download/upload requirements. On the other hand, even though the Premium plan solves those problems, it’s rather pricey. Due to the limitations of the Plus plan and the price of the Premium plan, I would advise you to shop around. If you’re not sure, then by all means use the free service and see how you like it. Lastly, note that there are plenty of comparable services, like ExpressVPN, which offer similar features at a cheaper rate. hide.me is a top notch VPN at an affordable price. Best thing about hide.me is its No logs policy, fast speed and P2P servers. These are the qualities that a savvy user looks for while purchasing a VPN. Fast speed at Free version is a big convincing point for the user because it only gets better when you move from free version to paid version.